Do you need to know how to broach retirement with your older employees? This HR manager sought ideas about how to ask a 67-year-old employee about her retirement plans without the possibility of age discrimination. She says that she would like to have a specific timeline that both the employee and the firm could work towards for her retirement. It is a delicate topic, and I have never had to do this before. I would call our attorney and ask, if I were facing this situation, because of factors related to potential age discrimination. You don't say why you'd like the individual to retire, and that can also make a difference. For example, can the employee still perform the job effectively? It may be that it is perfectly okay to ask the employee if she has retirement plans. But, it seems that you have a broader goal than just understanding the employee's plans. Consequently, this might not be your best approach. An employer, with the goal of workforce planning and knowing staffing needs, can ask an older employee if he has plans for retirement. That is within your rights as an employer. But, if the employee's response is negative, you don't have anywhere else to go with the discussion. If the employee gives a positive response, you can offer assistance with retirement details. Tell the employee that you need to know the date as soon as the employee decides so you can plan for his replacement. An employee who decides to retire may ask you for a phased retirement so that he can gradually let go of his work and coworkers. Retiring employees can be frightened about what their life will look like if they are not working every day. Federal law does not support mandatory retirement based on age except in a few instances such as a pilot. 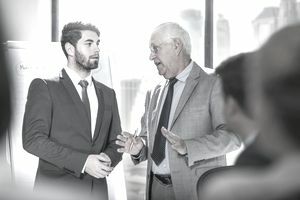 In the above example, when the employee says that he has no plans for retirement, pursuing the conversation further could be looked at as harassment, especially if the employer brought the subject up regularly. It could also be classified as age discrimination. If the pressure on the employee was increased, and the employee felt constant pressure to retire, the workplace could be considered hostile. The approach you may want to take is to sit every employee down in a private meeting and talk about their developmental needs and career development plans. In this way, you would not be singling out one older employee. It is possible that the individual would talk about retirement during that meeting. Career development and the opportunity to continue to grow skills is one of the top five things that employees want from work, so I support pursuing this process. Another approach you might consider using is to meet with all of your employees as a group and layout retirement options and opportunities and highlight company benefits related to retirement and time off work options. State that you would like as much notice as possible from any employee planning retirement or other life and career opportunities that might leave your company shorthanded. Your first step is to contact and discuss this situation with your attorney and tell him or her the reasons why you are inquiring about the employee's retirement plans. Some reasons are more legitimate than others. Your attorney may have experienced dealing with a similar situation with other clients. Ours often has ideas and options we didn't know. None of these methods guarantee the answer you'd like to obtain, but they give you some ideas. It is also recommended that you and your employer need to become clear about why you want the employee to retire. A good reason might give you options. If it's just because the person is old, this is probably age discrimination. Finally, in other instances of older workers over 55 or 60, you can consider extending an offer of early retirement that includes a severance package that encourages employees to accept.